Would love this shopping cart mouse! 2nd time a charm…lets hope. I would love to win this! You do an awesome job! Wow, what fun this would be to win. It’s two gifts in one! Thanks for the opportunity and for all you do. This is a great site! 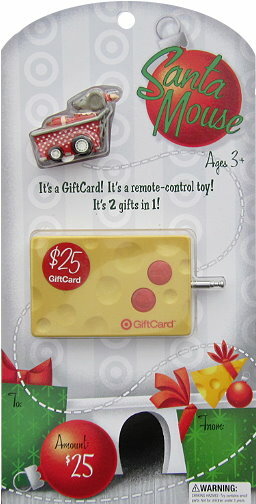 Here is my entry for your $25 Target WOW Gift Card giveaway. Wishing you and yours a very happy holiday! I would just be so thrilled to win this! Pick me! I would love to win this! Thanks! i LOVE totally target… and i like it on facebook too! enter me please. thanks for the op! Two gifts in one. Yipee!! squeAk, squeAk! pick me, pick me. hAppy holidAys! i now like totAlly tArget on FB. Yup, I “LIKE” !!! you on facebook. :o) The Target card would be wonderful! We are due to go there, actually tonight! Regular custoemrs there. Already a totally target fan on Facebook!!! Wishing you a blessed holiday. Thank you for all you do. I Like Totally Target on Facebook!! !